You saw in yesterday's post one of my favorite summer to fall trends, lightweight sweaters with shorts, well this is another one of my favorites; layering! I love throwing a cute flannel shirt over an outfit kinda like a lightweight jacket. I love the crochet detail on the neckline of this top. 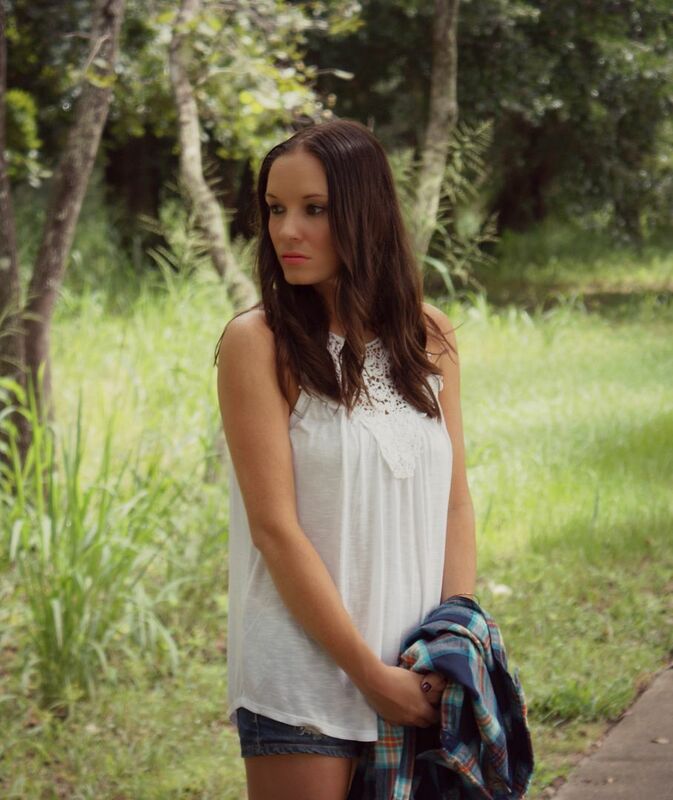 While the rest of the outfit is casual and more "rugged" the tank adds a feminine and girlie touch. Girl, country looks good on you!! Can we please talk about those legs and your workout routine - that's a post you must do!! I really love that flannel shirt - the colors are so pretty!! Love the country-ness of this look! Those boots are awesome! and layering the flannel is genius! Very perfectly summer to fall! you know i loe me some flannel! looking very fall-ish....now just hurry up and get the memo florida weather! At the risk of sounding totally creepy... your legs are AHmazing, ha ha! Love this look. I almost told you to get as much wear out of those shorts as you can, until I remembered that you live in Florida :) I'm going to be real jealous of your outfit posts in the next month as it starts to snow here and we will HAVE to bundle up! I love this look on you! Very rugged country, perfect for fall in Florida I'm sure! I love this flowing tank under the plaid - I would have never thought to do that! You look so pretty! Hocus Pocus! Best Halloween movie ever! I think your outfit is the epitome of a southern girl's outfit - so cute! Lucky the south is still having 80 degree weather, too. I adore this look on you - perfect! those boots are super cute as well. I want to watch Hocus Pocus at the theaters, that sounds so fun! You look so fab in this! Those boots are SO fun! That's such a fun plaid!! I liked how you wore it open like that I definitely need to keep that in mind with the new one I just got! Oh I like the open shirt, for some reason I always forget about doing that! Obsessed with those boots! I love the look of open plaid/flannel with shirts underneath. Those boots are so cute! You look fantastic!! Great outfit. Love that plaid shirt and those boots. Just fab!! Too cute!! Loving the country look! The flannel and lace looks perfect! In love with this country look! And so perfect for the transition weather! Love the crochet in that top and those boots! Too cute! Love this!!! I can't get enough of my plaid shirts right now!! Such a cute outfit and those boots couldn't be any more perfect if you tried! You look amazing! And this is perfect for the warmer fall weather! Happy October! SO cute! Love this transitional look! I love this look! The country look is just so fun! A little bit country, a whole lot of cute! :) Love this look! Looove those boots! Hocus Pocus is the best...I am dying to watch it, definitely one of my favorite things about October! Cute country girl! Love the bag. Loving this rugged but chic look for the country! Loving those sunnies. Love the boots! Looks great with the whole look! One of my favorite laid back looks! 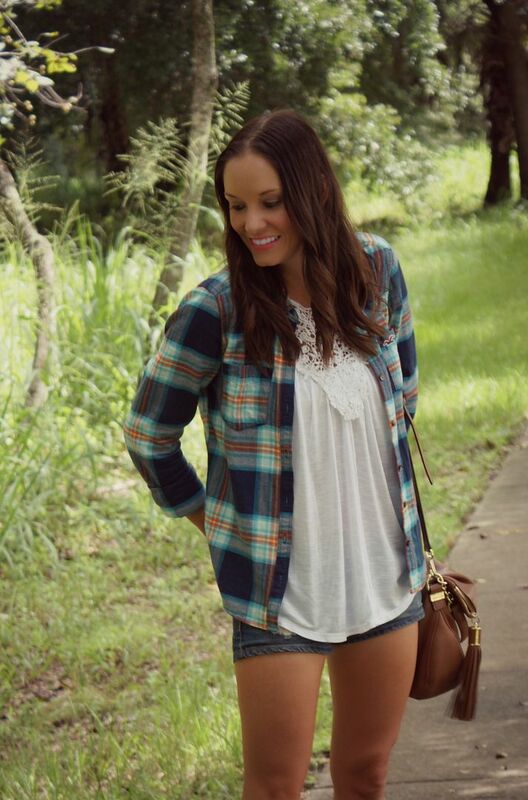 I love a plaid button down, denim shorts and booties! And isn't T Swift the best in concert?? I took my daughter a couple of years ago and we had a blast! I love this whole look! I've seen those shirts (the white one) and wasn't sure how to pull it off. But you did an amazing job! And I love the boots. Have fun watching Hocus Pocus, which is by far the best Halloween movie ever! Great outfit!! I love October! Happy first day of the month! 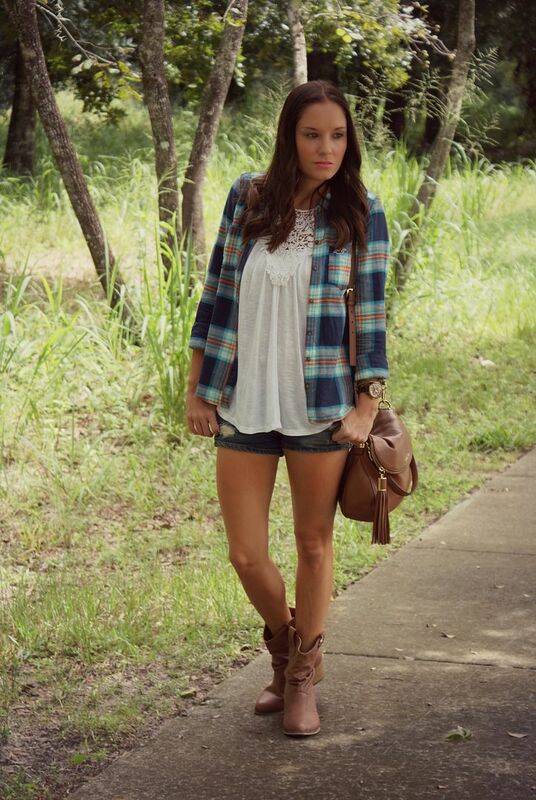 loving the boots and plaid combo! super cute outfit! Really loving this fall look! I'd kill for your legs, looking fab in country style!